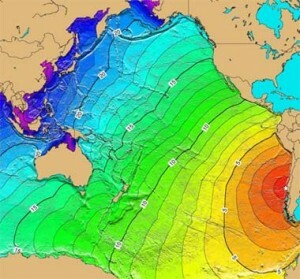 As many of you already know an 8.8 earthquake slammed the coast of Chile in the early morning hours Chilean time today. Hundreds are reported dead and the damage is widespread. This is among the top ten largest recorded earthquake in modern history since records were kept. The epicenter is on the coast near Concepción and damage extends all the way to the capital, Santiago, over 200 miles to the northeast. As I write this several tsunami waves generated by the Chilean temblor are racing towards the Hawaiian Islands with the speed of a jetliner and will mount Hawaii’s shores any moment from the time of this writing (2 pm Pacific time). Hundreds of thousands are being evacuated in Hawaii to higher ground as well as American Samoa and Guam. Next target after these will be the many harbors of Alaska’s southern coastline. Kodiak, Seward, Cordova, Sitka, Homer, Dutch Harbor, the Aleutian ports are on notice to evacuate. Signs are that the wave is losing momentum and the worst tsunami related damage is along the Chilean coastline around the quake zone. Many of your are writing in asking if the 16th-century prophet Nostradamus had anything specific to say about this earthquake. Here is a list of his most significant quake quatrains in their original French, then my translation and commentary. An important note to Nostradamus watchers. There are many more quake quatrains than what you see here. I have not included these because they are geographically specific to regions clearly not in the Pacific and mostly around Nostradamus’ corner of the world, the Mediterranean region. Ennosigee feu du centre de terre. Puis Arethua rougira nouueau fleuue. Earth shaking fire from the center of the Earth. And then Arethusa shall color a new river red. One deciphers Nostradamus by successfully following his classical allusions. Ennosigee is the Latin Ennosigaeus, or “earthshaker.” This is a surname of the god Neptune, implying a submarine quake and tsunami. Arethusa is a town in the ancient Roman province of Syria. Arethusa is also a classical Greek nymph who in legend changed herself into a spring. By calling Arethusa red Nostradamus warns us of lava flows. Therefore, this quatrain’s story line strays from referring to the quake and tsunami in the Pacific. We have had a Haiti quake in January, the great temblor in Chile this February, a series of record-breaking blizzards in Europe and North America in the same period. France in a state of emergency this Sunday alone from a sudden and violent storm ravaging the Mediterranean provinces. Mother Nature is sending us a message in 2010. She is declaring war on us. The years 2010 through 2011 will see a spike in climate change never before experienced. There will be stronger earthquakes, typhoons, tornadoes and hurricanes, droughts and floods will make all that happened in the 2009 and its far more devastating predecessor, 2008, look tame in comparison. Today, I cite some of my predictions in my newest eBook annual almanac because of the following prophecies of Nostradamus pinpointing the month, but not the year, of a significant swarm of superquakes coming in some future month of May. A GREAT QUAKE IN A FUTURE MONTH OF MAY? Near the Ebro they will be gathered in assemblies. When in May (spring) there are great earthquakes. Nostradamus, ever the passionate remote viewer of future geographic events targets northeastern Spain as severely visited. The great kingdom undermined could be the European Union. The assemblies are the refugees on the move from devastated areas. Mercury in Sagittarius, Saturn’s scythe will cut. From Spain the earthquake devastation to come sets the Vatican on fire and slams Northern Italy. Nostradamus does not make clear whether these two quatrains refer to one or two future quakes. The implication astrologically is Saturn and Mercury are together in Sagittarius as a date. Other quatrains implicate Saturn in Scorpio when nasty things hit planet earth in our near future. Saturn is in Scorpio again starting October 2012 with Mercury in Sagittarius starting at the end of October 2012. Hesperie often applies to North America. An important point to consider in our first quatrain earlier describing a “new city.” Thus, a quake foreseen in the 16th century that shakes the future Continental European state happens when another temblor hits North America. Could the New City be Los Angeles, or San Diego, or San Francisco? All of these great cities did not exist in Nostradamus’ time. Note in the next famous prophecy the play on Saints — what are Santa or San as prefixes for cities with Spanish names. Do these relate to Spanish cities in Northeast Spain or those western most Spanish named new cities of the Land of the West (Hesperie)? Sol vint de Taurus si fort terre trembler. The great theater full up will be ruined. The Sun transits 20 degrees into the sign of Taurus roughly every May 10-11 of each year. Nostradamus reports that his history of the future closes with the end of the planet 1,787 years from now in the year 3797 AD. That means this May of 2010 has a one-in-1,787 chance of being the time of a great quake. Given the intensity of dated astrological prophecies around the decades following the millennium, I would say the May months of this and the next few decades have more significance than those down the temporal road. A great theater (Hollywood?) falls. Is it a literal collapse of a theater or poetically implying Hollywood as the target? Is not the film industry capital the great theater of our times? Are people calling for their saints? Tombera gresle lors plus grosse qu’vn euf. (At that time) hail will fall greater than an egg. One zeros in on complicated astrological predictions by settling on which times in the future the distant planets pass through signs because they do this infrequently. Saturn transits Capricorn once roughly every 28 to 29 years. So let’s begin there. Saturn is in Libra right now. It will be in Capricorn again at the end of December 2017 through November 2021. Do some or all the other planets conjoin in Taurus and Virgo during the next Saturnian pass? Jupiter comes into Taurus in May 2023. Mercury is also in Taurus at that time. Good news. Mars does go into Virgo but not until July. And Saturn has left Capricorn and is in Pisces. So great earthquakes and volcanic hail, pumice the size of eggs raining down do not have a complete match of these astrological configurations in our near future. That doesn’t mean Nostradamus got his astrology right, though. Therefore, it might be good to look out for May 2023 as the most possible advent window for a major quake and volcanic event implied in these prophecies. The abyss of the temple ripped open at Easter (spring). Mortara is in Italy. This links us to the Lombardy location of quakes in the quatrain above (2 Q65). Cassich derives from the Greek Cassiterides, the classical names for the tin islands of Saint George (the name given to Cornwall and the Scilly Islands) of Saint George. The cross of Saint George was an early standard of England so Britain is visited by the quake. The numbers of wars in the world are at an all-time low since the Second World War. If the apocalyptic prophecies of Nostradamus are correct, then a potential and unanticipated unraveling of civilization in the 2020s would bring wars back to a civilization drowsy with peace — or rather lulled by generally peaceful decades, rendered unconscious of the oncoming threats of climate change bringing fights over resources. We are also in the era of his Third Antichrist. 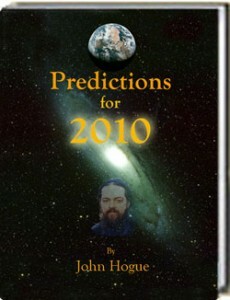 See Nostradamus predictions. Beyond what Nostradamus’ 16th-astrology says as calculated with all its potential inaccuracies, modern, computer-aided astrology calculates two significant astrological events coming at us just after May 2010 starting this June and again in August. There will be a grand cross of planets with Pluto in Capricorn (earth sign—read earth and political quakes) for June 6-26 and later August 6-7, 2010. I will write in more detail about this in the coming days of history’s quickening. This entry was posted in Earthquakes and tagged 1 Q87, 10 Q67, 2 Q65, 2012, 6Q88, 9 Q83, Arethusa, Astrology predictions, Chile quake, Chile Tsunami, earthquake prophecies, fufilled predictions, grand cross of Pluto, grand square of Pluto, Haiti quake, Hawaiian Islands, John Hogue, May quake, Nostradamus and the Chile quake, predictions, predictions for 2010, predictions for 2012, prophecies, prophecy. Bookmark the permalink. Post a comment or leave a trackback: Trackback URL. I’m almost sure this was the prediction for 1960’s Chile Earthquake, largest earthquake recorded. Saturn in capricorne,venus in taurus…not exactly the same….but hey, almost accurate ….scary. Three fifths correct, unless the odd syntax of the third line implies Venus “also” (is in) Cancer, then not so close. In defense of this interpretation, calculations of future aspects made by hand and not by a computer are prone to mistakes. Even the best mind and stone chipping calculations of the Maya are apparently off by 13 years. Their 2012 happened between the winter solstices of 1998 and 1999.